Class 2 Type A – Air 70% re-circulated. 30% Exhaust Through HEPA and Duct. Our name is enlisted amongst leading companies for providing quality tested Laminar Air Flow Cabinet to the clients at very reasonable price. 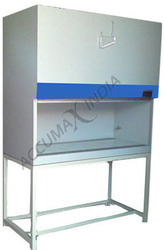 - This complete package unit is provided to give clean air to any laboratory. Having 99.99% efficiency 0.3 micro particles size.